Kuriyama - Urevac-3 Heavy Duty Polyurethane Material Transfer Hose - 3 in. X 50 ft. - OD: 3.6 in. • Lightweight polyurethane construction - provides good flexibility in sub-zero temperatures . .. ideal hose for intermediate material transfer application where a heavier hose will not work. 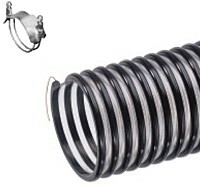 • Black exposed helix design with embedded copper grounding wire - provides high abrasion resistance and permits hose to slide more easily. Copper grounding wire allows for grounding hose in static conditions. • Smooth bore - eliminates material build up.